KINGSPORT — Kingsport school and city officials formally opened The Castle Playground at Johnson Elementary School in a ribbon cutting Friday morning, pronouncing it an embodiment of the Kingsport Spirit with volunteers coming together to build a community playground in six days. Nic and Jenny Clemmer, Kingsport residents and natives who donated a little more than half of the money to build the playground, said it was not a gift, but an investment in the community’s future. 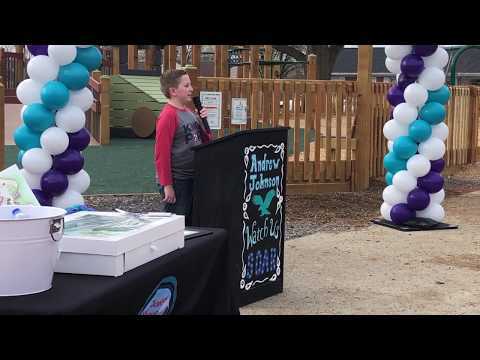 The new “one-of-a-kind” playground, as described by Principal Stacy Edwards, was designed by New York-based Play by Design with input from students. It has a cost of about $200,000, all covered by fundraising by the Johnson Parent Teacher Organization. It replaces the nearly 30-year-old original castle playground, which was demolished in December. Plans are for additional fundraising to expand the playground, possibly including a toddler area, musical accessories and additional play equipment. The community playground at the 550-student school is handicapped accessible and includes a climbing wall, racing slide and pirate ship, as well as the iconic castle steeples in keeping with the tradition of the original playground built in 1990. Edwards said construction manager Jim Taylor and all the volunteers were essential to the project, as was PTO President Ashley Hill. He also called out the “Awesome Boys,” a group of crew leaders who did preliminary work and preparation of the site. The name came from students who saw the crew leaders working. Hill said at one point PTO members feared the group wouldn’t have enough funds until 2030 at the rate the cookie dough, pizza kits and walking events were generating money before the Clemmer family donated more than $100,000. The main March 5-10 build included rain and wind chills as low as 5 degrees one morning. All told, about 1,000 people volunteered for the build. Those who helped ranged from 5-year-old kindergarten students who soaped screws to make them easier to install in boards to an 84-year-old volunteer.